Bunga Pine or False Monkey Puzzle Tree is a tall and majestic evergreen tree that is conical when young and becomes more domed as it matures. The seeds are edible and considered a delicacy by Australian Aborigines. The flavour of the edible kernel is similar to a chestnut. Its high quality wood is used for making cabinets, flooring and plywood while the branches are used for fencing and fuel. 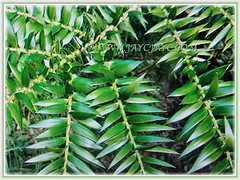 Botanical Name: Araucaria bidwillii (syn. : Araucaria bidwilliana). 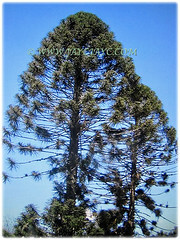 Common Names: Bunga Pine, Bunya-Bunya Tree, False Monkey Puzzle Tree, Queensland Pine. Etymology: The specific epithet bidwillii is named in honour of the botanist John Carne Bidwill who came across the plant in 1842. Origin: Native to Southeast Queensland, Australia. 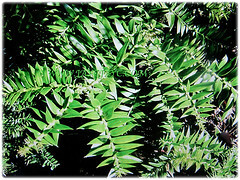 Plant type: An evergreen and flowering tree. 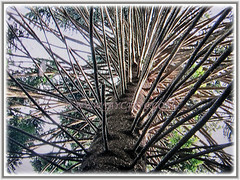 Features: Araucaria bidwillii is from the genus, Araucaria that comprises of 18 species. The Bunga Pine is a very large and evergreen coniferous tree with evenly spaced horizontal branches that are arrange in regular tiers and whorled around a trunk that continues to the very tip of the tree. A young tree is conical and wonderfully symmetrical but will eventually become rounded and loose the lower branches. The tree can grow between 30-45 m tall. It has two kinds of leaves. 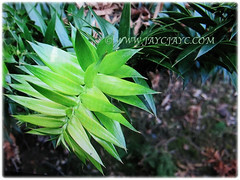 The glossy juvenile leaves are narrow, 2.5-5.1 cm long, stiff and sharp-pointed. They are spreading and arranged in two rows on the branchlets. On the other hand, the woody mature leaves are oval and only 1.3 cm long. They are twisted, spirally arranged and overlapping on the branchlets. 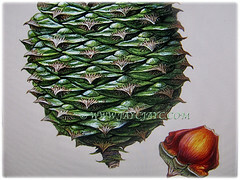 This species is dioecious with female bunga-bungas producing large, spiny and pineapple-shaped cones up to 23 cm long and 20 cm in diameter. Male cones are small. They can weight up to 8.2 kg. 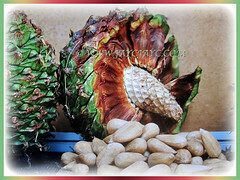 When mature, the cones will release the large 3-4 cm long seeds or nuts, easily separating from the cone scale. 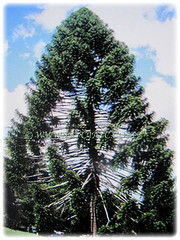 Culture (Care): Araucaria bidwillii or Bunga-Bunga Tree grows easily with the least maintenance. Moisture: Medium water requirement. Water regularly, especially for container plants. Soil: Loamy, chalky, sandy and well-drained soils. Others: Take note that the leaves are spiny and falling cones could be lethal. Little or no pruning is needed as this can permanently spoil the shape of the tree. Feed the tree with a balanced fertiliser once every two weeks. Generally free from serious garden pests and diseases. However, honey fungus may be a problem. 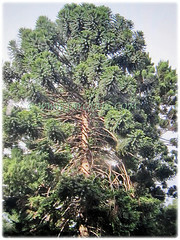 Araucaria bidwillii or Bunga-Bunga Tree can be grown in protected sites in zone 8b. House plants should be provided bright light but not direct sun. Grow as a containerised tree under glass in areas liable to temperatures below 5°C. The plant may be placed outside in a sheltered and sunny position during the summer in a container and easily brought indoors to overwinter. Propagation: Easily propagated from seeds that usually germinate within 1-2 months. Alternately, it can be propagated from tip cuttings but it’s been reported to be difficult. Usage: Araucaria bidwillii or Bunga-Bunga Tree with its distinctive silhouette will be excellent elegant specimen for large landscapes, parks and avenues. It will be an ideal houseplant as it’s very tolerant of low light conditions. Suitable to be grown in a container to contain its growth and keep it small for years. Sometimes, it is used as wind breaks. Large specimens make great evergreen shade trees. Its seeds are edible and considered a delicacy by Australian Aborigines. The flavour of the edible kernel is similar to a chestnut. Its soft wood is of high quality and is used for making cabinets, flooring and plywood while the branches are used for fencing and fuel. Camellia japonica and its cultivar ‘Pink Perfection’ is so mesmerising!